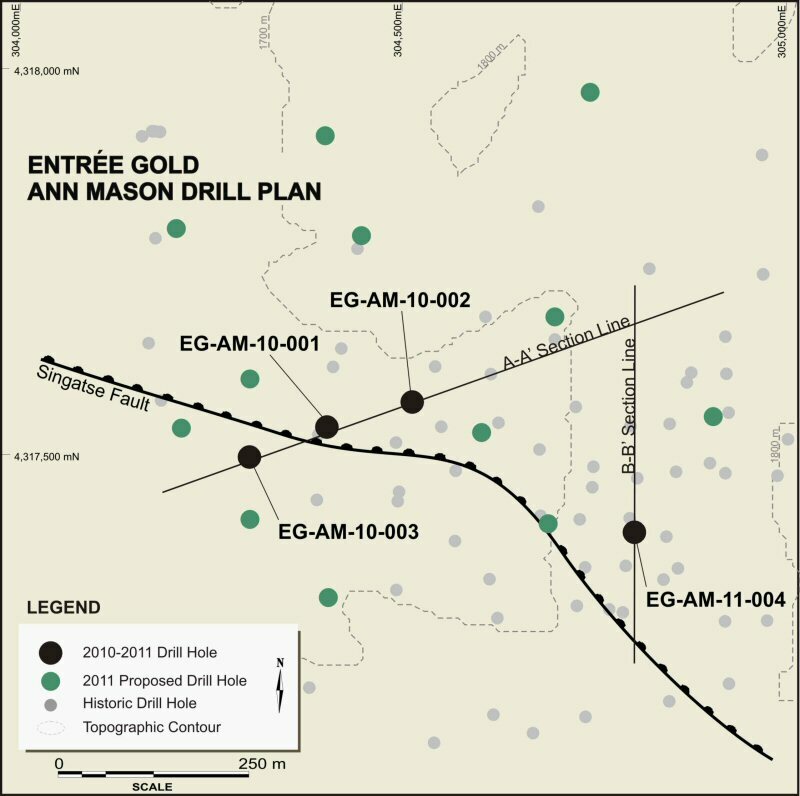 Entrée Gold Inc. (TSX:ETG)(NYSE Amex:EGI)(FRANKFURT:EKA) ("Entrée" or the "Company") has received assay results from three additional deep diamond drill holes on the Ann Mason deposit in the Yerington district of Nevada. Each hole returned long intercepts (584 m to 718 m) averaging 0.38% to 0.42% copper equivalent ("CuEq"). Higher grade intervals were also encountered, as shown in Table 1 below. Hole locations and cross sections can be viewed at www.entreegold.com. Entrée's President & CEO, Greg Crowe, commented, "In this latest round of drilling, holes 002 and 003 have further extended the known limits of mineralization. This reinforces the Company's belief that the size of the resource at Ann Mason could increase substantially. We are also seeing higher grade copper intersections, particularly in these holes on the western side of the deposit. The results also highlight molybdenum, gold and silver in sufficient quantities to increase the overall copper equivalent grade by more than 10% over copper alone. Historic work on the project did not systematically test for these valuable metals. We plan to have an updated resource estimate for Ann Mason in 2012, after which we can consider how best to advance this substantive asset." Hole EG-AM-10-002 is located 100 m northeast of EG-AM-10-001 (refer to February 7, 2011 news release) and returned 584 m averaging 0.38% CuEq starting from 86 metres depth. 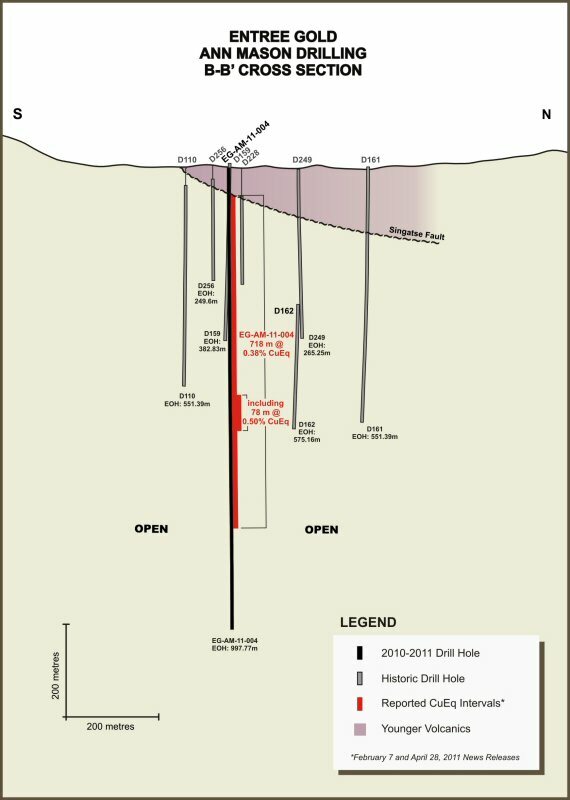 This extends mineralization 100 m north from the nearest historic drill hole, and mineralization remains open to the north on this drill section. Hole EG-AM-10-003 is located 100 m southwest of EG-AM-10-001 and returned 642 m of 0.42% CuEq, starting at 436 m, and includes a higher grade intersection of 124 m averaging 0.71% CuEq. This extends the western limit of known mineralization laterally by 100 m and the deposit remains open to further extension to the west and south. 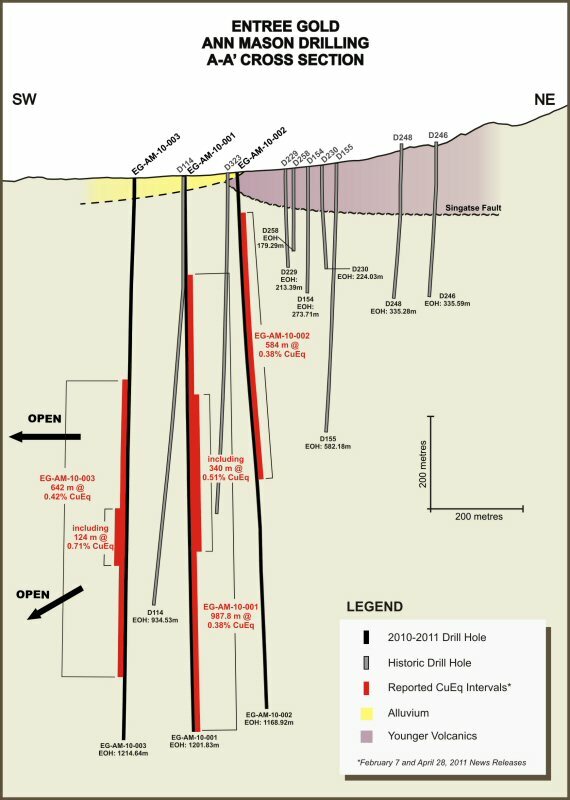 Drilling on the western side of the Ann Mason deposit (Holes EG-AM-10-001 to 003) has confirmed potential to expand the size of the deposit significantly. Grades remain consistent or may potentially increase to the west based on recent drilling. The deposit is also open to the north and south along many of the existing drill sections. Hole EG-AM-10-004 is an infill hole located in the east-central area of the deposit and approximately 420 m east-southeast from EG-AM-10-001. This hole returned 718 m averaging 0.38% CuEq from 62 m. This hole extends mineralization 200 m deeper than the previously known limit in this part of the deposit and confirms the internal grade and continuity of the deposit. Historic drill holes near EG-AM-10-004 were drilled to less than 600 m depth. The Company has three diamond drills operating at Ann Mason to expand and better define the inferred resource of 810 million tonnes grading 0.40% Cu (more than 7 billion pounds of contained copper). To date, six holes totalling 6928 m have been completed and an additional three holes are in progress. A fourth diamond drill is also operating at the Blue Hill target, located 3 km west of Ann Mason, testing for deeper sulphide copper mineralization. A reverse circulation drill will commence work in the Blue Hill area to begin outlining potential for a shallow copper oxide resource in mid-May. Mr. Crowe concluded, "Entree's assets at Ann Mason and Blue Hill are often overshadowed by our considerable holdings in Mongolia. Our Mongolian assets are on the path to development, and we are carried to production by our joint venture partner through debt financing. This arrangement allows us to focus on these promising advanced stage exploration projects in Nevada." This News Release contains forward-looking statements and forward-looking information (together, "forward-looking statements") within the meaning of applicable securities laws and the United States Private Securities Litigation Reform Act of 1995, with respect to its exploration results, the potential for extending known mineralization and discovering new mineralized zones, the potential size and grade of the resource at the Ann Mason property and future exploration programs and budgets. These forward-looking statements are made as of the date of this news release. Users of forward-looking statements are cautioned that actual results may vary from the forward-looking statements contained herein. While the Company has based these forward-looking statements on its expectations about future events as at the date that such statements were prepared, the statements are not a guarantee of the Company's future performance and are subject to risks, uncertainties, assumptions and other factors which could cause actual results to differ materially from future results expressed or implied by such forward-looking statements. Such factors and assumptions include, among others, the effects of general economic conditions, the prices of gold and copper, changing foreign exchange rates and actions by government authorities, uncertainties associated with legal proceedings and negotiations and misjudgements in the course of preparing forward-looking statements. In addition, there are known and unknown risk factors which could cause the Company's actual results, performance or achievements to differ materially from any future results, performance or achievements expressed or implied by the forward-looking statements. Known risk factors are described in the Company's Annual Information Form for the financial year ended December 31, 2010, dated March 25, 2011 filed with the Canadian Securities Administrators and available at www.sedar.com. Although the Company has attempted to identify important factors that could cause actual actions, events or results to differ materially from those described in forward-looking statements, there may be other factors that cause actions, events or results not to be as anticipated, estimated or intended. There can be no assurance that forward-looking statements will prove to be accurate, as actual results and future events could differ materially from those anticipated in such statements. Accordingly, readers should not place undue reliance on forward-looking statements. The Company is under no obligation to update or alter any forward-looking statements except as required under applicable securities laws.